*Post updated to reflect the impact after 6 months. We love the excitement and stories our clients bring us. It fuels our creativity and problem-solving. Client meetings are typically filled with passion, but a recent client, GraceInside, introduced us to the inspiration provided by poptarts. It was a small gesture, but one that symbolized them inviting us into their world. 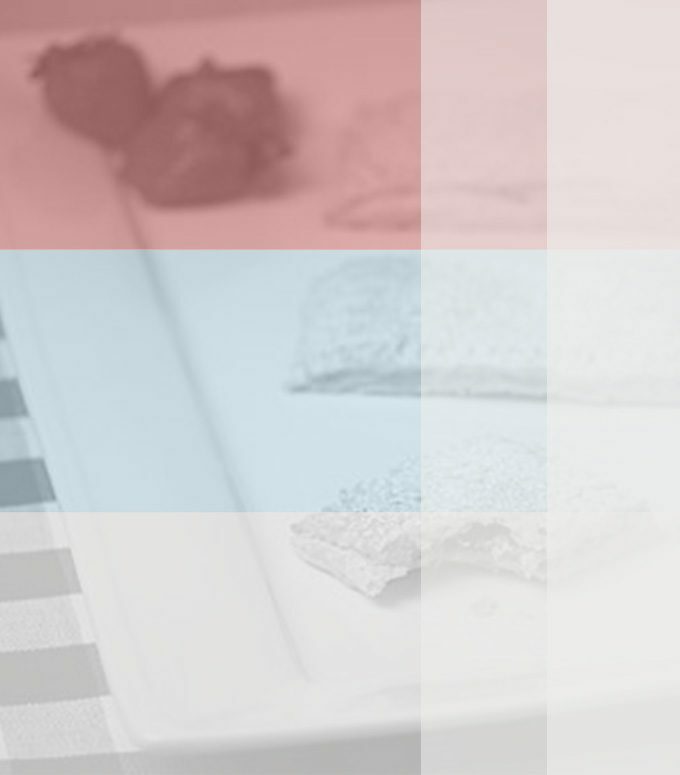 Trust is essential for a successful project, and enjoying a poptart together was the beginning of sweet collaboration, which made all the difference in solving challenges and creating meaningful impact. When we first met this particular client, we each called them a different name – we honestly could not remember the amount of words, nor the order in which they came in the organization’s original name. After many “hey you’s” and “my man’s” and “yo dude’s”, in attempts to avoid saying the wrong name, we recommended a name change. If we had trouble remembering their name, likely their donors would too. “Chaplain Service Prison Ministry of Virginia, Inc” is a mouth full, and even now, I triple checked to make sure I typed it correctly. They trusted us to take the risk of an identity crisis, because we understood and were willing to jump into their fears with them. Our job was to navigate through the deep waters of people not recognizing them, or losing the nostalgia and history of their name. We did this by reminding them of the goals set at the beginning of the project – to tell better stories. We replaced fears with steps toward their goals, as every good story needs a good title. We tested name options with mock phone calls, pretending to answer a call from a supporter with the new name, or introducing ourselves to new supporters. Through this process we encountered another challenge to our goal: the stories of this organization happen behind locked doors, literally in Virginia’s State Prisons. 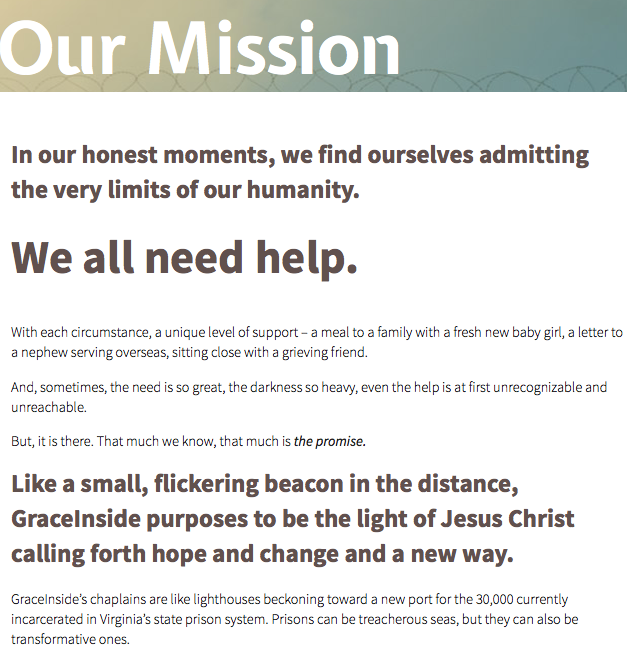 The state of Virginia does not finance chaplains in state prisons. So the mission of our client is to financially support and spiritually maintain a chaplain in each of the state prisons. The idea of bringing people inside prison walls came up, showing that change happens inside, both figuratively in a person, but also literally inside prison walls. Thus the name GraceInside. It’s easy to say, quick to remember, and gets to the point that the hardest work happens inside – after all, lives are changed from the inside out. Challenge 3: How to not kill the content. A story needs more than a beginning. Most people hear about prisoners and fill in the rest. We certainly did in the early stage of the process, but by listening to our client, our own minds were changed. They needed their content to educate on a topic about which their audience already had conclusions. They needed to re-write the story on behalf of people inside who couldn’t tell it for themselves. Every interaction with the client included them telling us a story of a person whose life was changed by their relationship with a chaplain. Stories of hope, stories of failure and trying again, stories of life. Our biggest fear was when they moved from talking to typing, this would be lost. So we kept the poptarts, and at the expense of a sticky keyboard, the words that came back to us burst with life, tugged at heart strings, and influenced thoughts. Regardless of their specific story, each organization has a story to tell. And the way they tell their story impacts the support they receive. The work we invested at the beginning of the project to understand who GraceInside was and who they were becoming, enabled us to provide them with inspiration to confidently share their stories. The trust they offered us enabled us to know them, to guide them through taking risks, and to help them grow. If the goal of design is to make content accessible, our work needed to bring the text to life. Design influences copy, and copy influences design – neither can be done in a vacuum, they have to happen together. Through this project, we learned the value of trust, and the privilege of collaborating with organizations seeking to make a difference in the world. Previous website, branding, logo, and name. New website, branding, logo, and name. *Update: Did it make a difference? Design seems subjective. Can a color cause connection? Do words inspire action? Can a layout influence understanding? Or to be more blunt – is this going to cause growth for my organization? The impact of those increases is not subjective – more work is being done, more awareness is being shared, more lives are being changed. We’d love to help you make the same difference with your efforts. Claire values context, creativity, and joy. She uses these skills to help causes invest in the good of others.